The Palomar StarLux 500 laser machine represents an advancement over the previous Palomar StarLux 300 system, and this versatile machine allows you to offer a wide range of aesthetic treatments. Despite the long list of procedures it is capable of performing, the Palomar StarLux 500 laser machine is remarkably compact, with the main system weighing just 58 pounds. The Palomar StarLux 500 system is more powerful than the previous generation and it features advanced contact cooling and photon recycling. And with the combination of a laser and IPL, the Palomar StarLux 500 can produce results with far less patient discomfort as compared to other options. 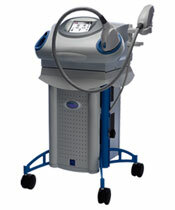 Contact us today for a no obligation price quote on a pre-owned Palomar StarLux 500 laser machine. Weight: System – 58 lbs., Chiller – 35 lbs., Cart – 56 lbs. Even though the Palomar StarLux 500 laser machine is a more advanced version of the StarLux 300 system, that doesn’t mean you need to pay a high price for the latest technology. At SunrayLaser.com, you can find a used Palomar StarLux 500 laser system for a cost that is less than half of the new retail price. If you have concerns about buying a pre-owned cosmetic laser system, you should know that we professionally test and inspect everything we sell, and that we offer a complete satisfaction guarantee. So contact us today to get a free price quote on a quality used Palomar StarLux 500 laser machine.